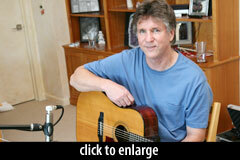 The final session of the $60,000 Ribbon Mic Shootout took place at my home in Sonoma County. The artist is local songwriter and friend Michael Capella, who you might recognize from previous features in this space, such as the recent Oktava MK-012 Figure-8 capsule review or the infamous Black Lion Audio Signature Series Mod for Digi 002 (59 comments and still raging!). Michael was feeling under the weather on the day of the session, but he came out nonetheless and played like a champion for the two hours it took us to cycle through 18 ribbon microphones. You can hear them all blind, below, including the rear side of the R84, R121, and KSM313. Michael sat in the center of a large room with a 12' cathedral ceiling. We positioned the microphones 12–14 inches away, side-by-side (as close together as possible), pointed at the 12th fret. Mic positions were marked with a string jig to ensure consistent placement. 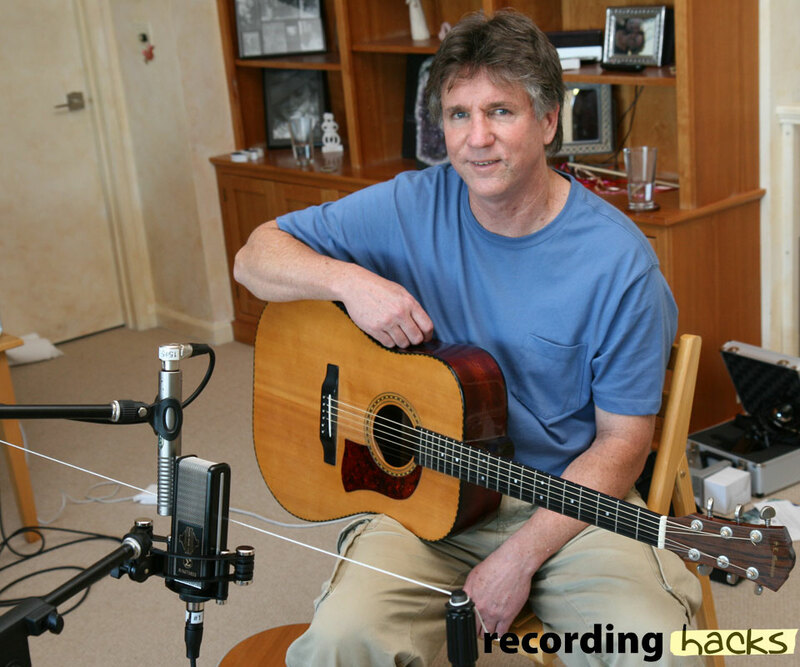 We recorded two microphones per pass, to save time and reduce artist fatigue. All passive ribbons were amplified by a pair of True Systems P-Solo Ribbon preamps (graciously loaned by Tim Spencer and Sennheiser USA). Active ribbons needed much less gain and were therefore not likely to be colored by my built-in DAW preamps (the aforementioned BLA-mod Digi 002-Rack). We tracked this session at 24-bit, 48 kHz. Michael played a short melody on two guitars (erm, one at a time), through each pair of microphones. 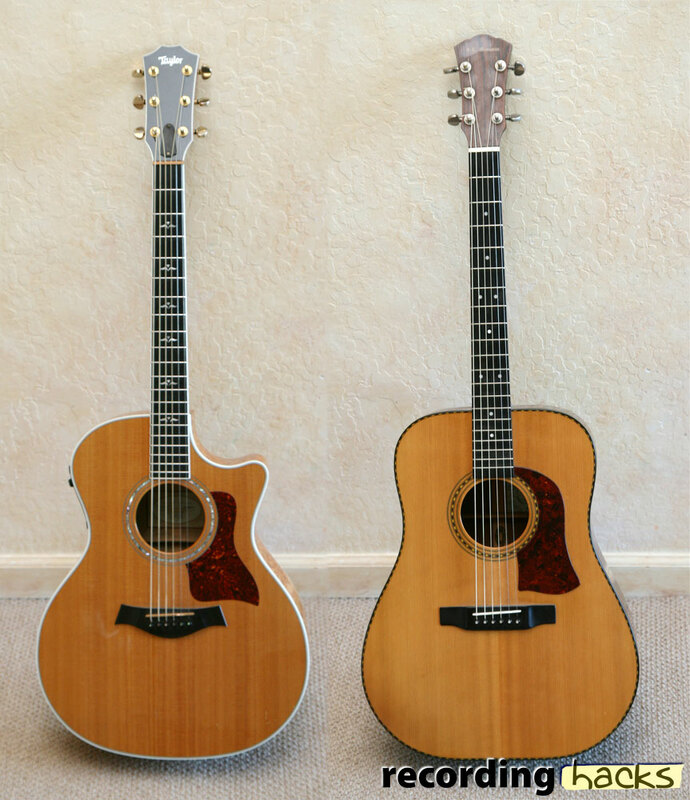 The first guitar was a Taylor, and the second was a vintage Mossman. 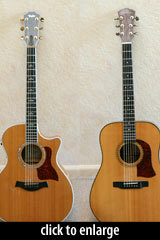 The guitar on the right is a 1975 “S.L Mossman” Tennessee Flat Top. It has a dreadnought body style, mahogany back and sides, sitka spruce top, and ebony fingerboard. I purchased it new in May of 1976 in Aptos, CA, for $400 and have played it ever since. The other guitar is a 2000 Taylor 614CE. It has a Grand Auditorium body with cut-away, maple back and sides, sitka spruce top and ebony fingerboard. The Grand Auditorium body is smaller and thinner than a dreadnought. I purchased it new in January, 2001. It has been my main gigging guitar the past 10 years. I use light gauge (.012 to .054) Elixir polyweb strings on both guitars. The audio tracks embedded below are from the Taylor. These tracks have been high-pass filtered (-12dB/octave @ 120 Hz) to reduce proximity effect and rumble. I gain-matched the filtered tracks in Pro Tools, output 24/48 WAV files, and converted to 320 kbps MP3s via lame. 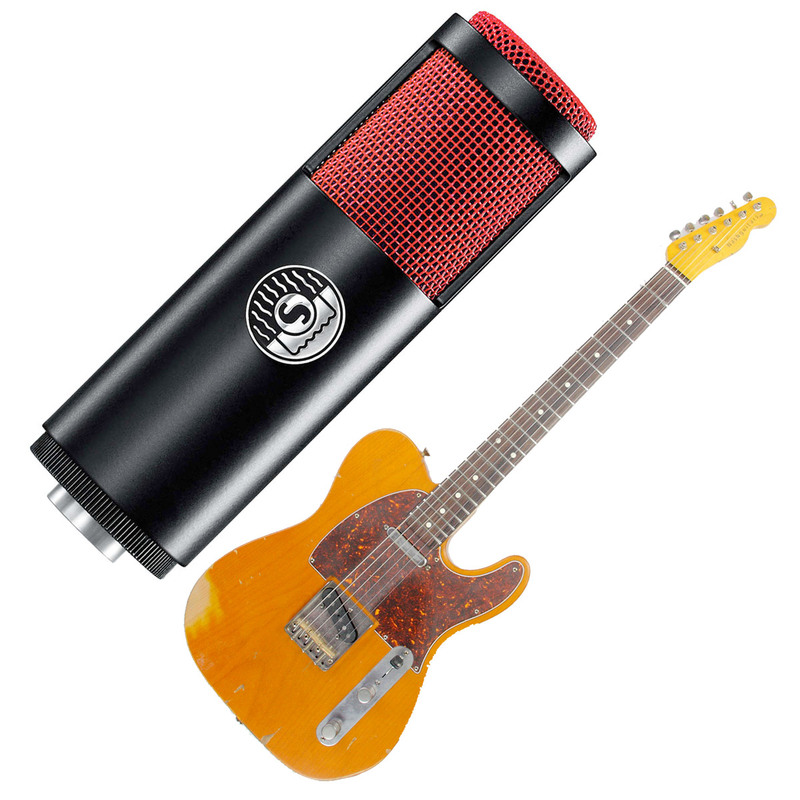 Download the full-resolution, unfiltered WAV files for both guitars: 22 mics x 2 guitars = 44 tracks total, here. Yes, the chair squeaked. Don’t they all? Michael’s playing is remarkably consistent in tempo and volume across all these tracks. Yet there are subtle performance differences. Rather than risk attributing these to the relative abilities of the microphones, I first listened to the playback by pairs. In many cases found the pairs of mics to sound much more similar than I expected. Take the MF65 (#5) vs. KSM353. I had a hard time distinguishing these two. Both sound beautiful, with a balanced tone, very smooth highs, and just enough growl to make the chords authoritative. On the Taylor tracks, I think you could punch one in for the other and not notice the change. The 4038 and R-121 also sound very similar. I can distinguish these when I solo back and forth, but it’s a subtle change. Both of them are brighter than the first pair, and both come across as a little more unrestrained for this reason. The third pair I tried, the KSM313 (rear) and Cascade Vin-Jet, presents more contrast. 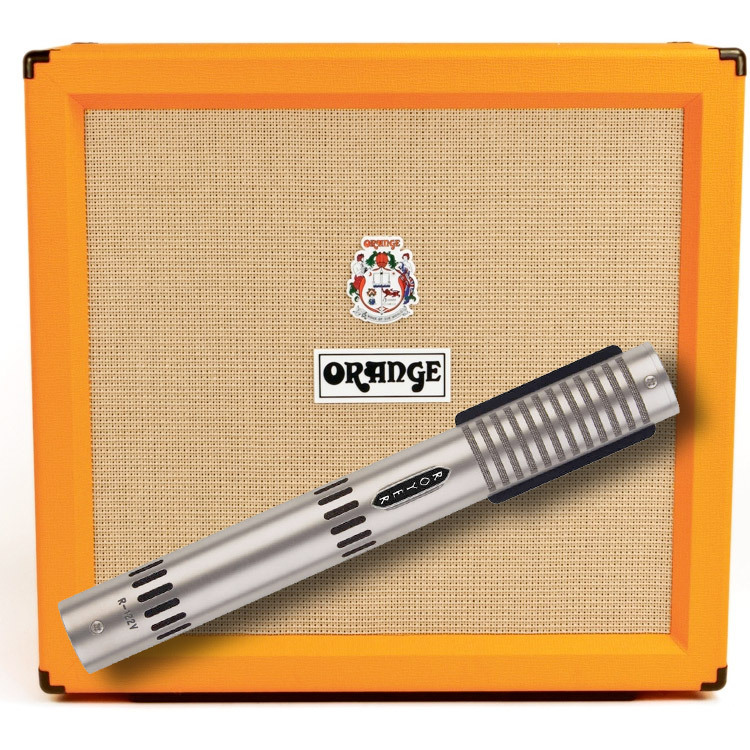 The KSM313 sounds mid-forward, and has more definition on top. But the Vin-Jet reaches an octave lower. Which works best depends on all the usual factors: the guitar, the song, the needs of the production. There is an audible contrast between the R-121 (rear) and Sigma, as well. The latter is a bit veiled, as if the top had been rolled off. The transients are still there, but they’re muted. This is the Sigma’s characteristic “vintage” sound. The back side of the R-121 is brighter, giving more definition to each string, and a more open sense to the strummed parts. Listening across pairs, there are some interesting comparisons, like the Vin Jet vs. the Shinybox 46U. 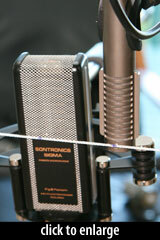 These microphones share a basic ribbon geometry, but use different transformers and grilles. The Vin Jet reaches much lower, probably due to the Lundahl transformer, and needs that high-pass filter in a way that the 46U does not. The 46U has a nice chimey top end that complements these guitars, but due to its leaner low end lacks impact on the strummed section. The Royer R-101 and Cascade Fathead provide another interesting comparison. Both are mid-forward. The R-101, like the 46U, is lean on the low end, producing less proximity effect. And it has an interesting sound that I have a hard time describing: it sounds present, without much ambiance, with a sort of compressed quality that keeps the transients from poking out. I’d like to know what you hear. Just one request: please don’t preface your comment with “I listened to these over my laptop’s built-in speakers,” because I think everyone will stop reading at that point. We have no affiliation with AEA, Audio-Technica, beyerdynamic, Cascade, Cloud, Coles, Karma, Royer, Samar, Sennheiser USA, Shinybox, Shure, Sontronics, TnC, True Systems, nor their distributors. 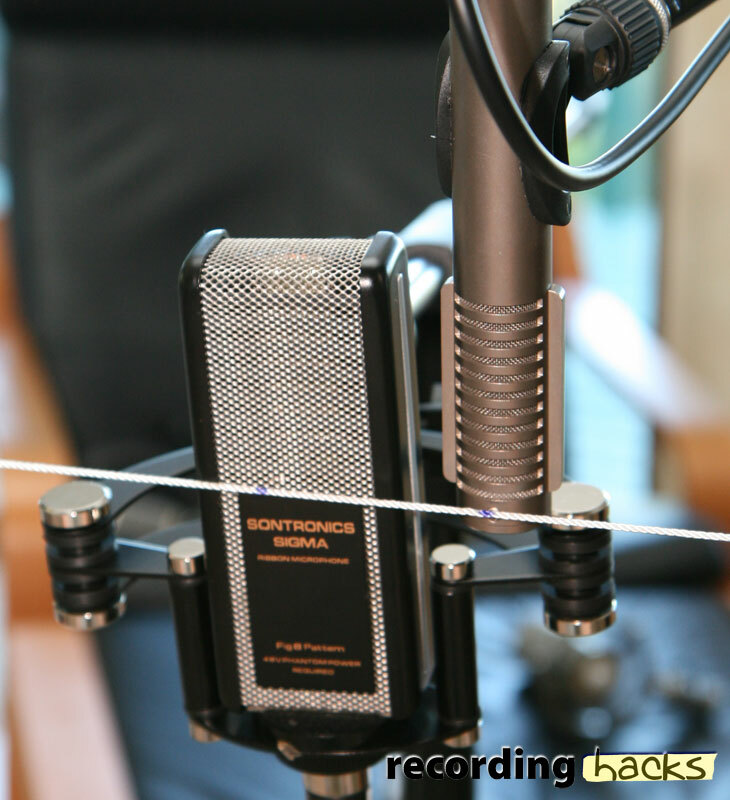 Most of the microphones in this test, and the P-Solo Ribbon preamps, were loaned to us for evaluation purposes. Unfortunately, we don’t get to keep them. I owe Michael Capella a great deal of gratitude and maybe dinner, too, for donating his time for this session. Thank you, Michael! I have been really surprised at how well they sound on acoustic guitar. And that M130 is a mic I hadn’t really heard before this shootout and I think that I like it. M130 with the Sank mod is one of my fave mics. Liked the AEA R84 the most and the beyerdynamic M 130 the least; what’s that weird sound at the end of the Audio-Technica AT4080 clip? Nevermind. I missed it where it said that the weird noise was someone’s iPhone. I preferred the AT4080: it is well balanced and exhibits presence with a hint of warmth. Very nice ! Thank you much for this great test ! I also thought the AT4080 was the standout here, by a wide margin. Which is interesting because I didn’t find it that terrific or better than the pack on the electric guitar shootouts. I’m amazed that to me one of the cheapest ribbons sounds the best: the Shinybox 46U. Seems to have a more detailed top end, like the Vin-jet but with less mud in the mud region. I like the 121 and Samars a lot but many of these could be used successfully with a bit of EQ, I think. I have no experience with ribbon mics so thank you for this great comparison. I finally narrowed it down to 7 & 13 -> Coles 4038 & Samar mf 65. I also liked 4080 and the Vin Jet a lot. Thank you for the testing, very interesting.